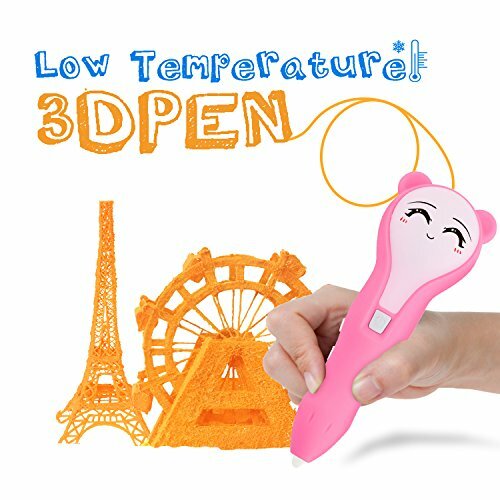 - For those clients who experience the 3D printer pen for the first time, the experience effect may not very ideal, but it doesn't matter, because they just haven't used to use 3D printer pen to create. please be patient and use your imagination, you will find its a very magical process. - When you first load the print pen for filament, the color that may first come out is different from the color of the material you load, but please don't worry, it's the residual pigment after the factory test. LOW TEMPERATURE: Compared to ABS (180-210°C) and PLA (160-180°C), PCL has a melting point of only 60-65°C. The nozzle temperature is 15-20 °C (can touch the skin), low temperature means safer. If the creation is unsatisfactory, you can soak it in warm water at 50°C for 5 seconds, it can be remodeled like plasticine. CHARGABLE: Use the built-in rechargeable battery, fully charged can be used for 2 hours, do not connect the power during use, no restrictions on the use of the site. EASY TO USE: There are four buttons on the pen, the one on the surface is for turning on and off; the first one on the left is for unloading the filament; the second is for controling the speed; the last one is for loading filament and stopping. PACKAGE INCLUDES:3D teddy bear printing pen, USB charger, Stencils, Molds, Emoji's, User Manual, 4 DIFFERENT COLORS of 1.75mm PCL filament. NO WORRIES GUARANTEE: Shop with us, 100% satisfaction is guaranteed. 30 days return [replace] a purchase, 1 year Warranty and whole-life customer service, please contact us through support@szider.com if you have any problem with this 3D pen. We will offer you solution within 24 hours. Manufacturer: Shenzhen IDER Technology Co., Ltd. Publisher: Shenzhen IDER Technology Co., Ltd. Studio: Shenzhen IDER Technology Co., Ltd. If you have any questions about this product by IDER, contact us by completing and submitting the form below. If you are looking for a specif part number, please include it with your message.